Cream of Tartar is a powdery white, acidic salt made from reacting Tartaric acid with Potassium Hydroxide. Tartaric acid is a naturally occurring substance found in grapes, obtained from the sediment produced when making wine. White powder derived from crystalline acid deposits. 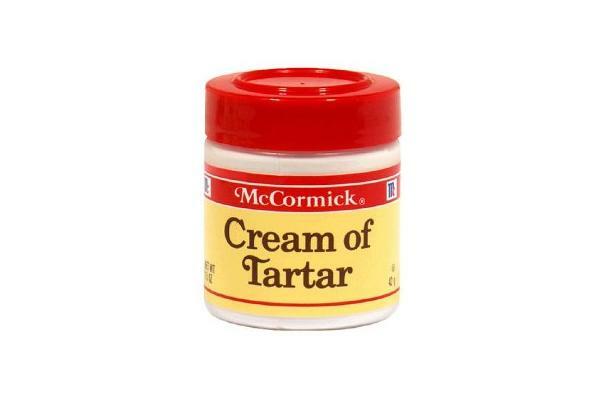 Procuring: Cream of tartar is made by neutralizing tartaric acid halfway with potassium hydroxide, transforming it into a salt. Grapes are the only significant natural source of tartaric acid, and cream of tartar is obtained from sediment produced in the process of making wine. Cream of tartar is widely known to help stabilize and give more volume to beaten egg whites. It is the acidic ingredient in some brands of baking powder. It is also used to make a creamier texture in sugary desserts just like candy and frosting, as it inhibits the formation of crystals. Commercially, cream of tartar is used in some soft drinks, candies, bakery products, gelatin desserts, and photography products. In cooking, Cream of Tartar is used to give a creamier texture to icings and candy and to add volume and stability to egg whites in baking. It is also a key ingredient in baking powder, and it is often added to sodas, souffles and other baked goods. While there is no equivalent substitute, a equal amount of lemon juice or vinegar may work. In a recipe that calls for baking soda in addition to cream of tartar, use baking powder instead of both the baking soda and cream of tartar: baking powder is 2/8 baking soda and 5/8 cream of tartar. Store tightly sealed in a cool, dry place for up to one year. History: Known in the old times as tartar, tartaric acid was first isolated from potassium tartrate, around 800 AD y Persian alchemist Jabir ibn Hayyan. The modern process was developed in 1769 by Swedish chemist CW Scheele. The chirality of tartaric acid was discovered in 1832 by Jean Baptiste Biot. He observed its ability to rotate polarised light. The uses and processes of making cream of tartar were further developed in French cuisine.